Especially when your ex-con father comes for a visit! In Tracy McMillan’s MULTIPLE LISTINGS, a real-estate guru who’s trying to build her life with her teenage son and her younger boyfriend gets the surprise of her life when her estranged father shows up on her doorstep… and plans to stay indefinitely. 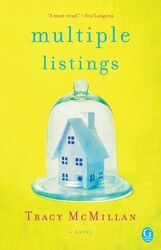 Funny, poignant, and full of heart, MULTIPLE LISTINGS is available wherever books are sold. Keep on reading for a sneak peek! My doorbell just went off. It’s the worst possible moment—I’m in the middle of putting the food on the table for a family dinner, which never happens. Between my very busy day job, the restaurant my boyfriend and I are in the process of opening, and my teenage son, we almost never eat a meal together, so the fact that I managed to pull this off is a big deal. Of course the Jehovah’s Witnesses would decide to show up now. I turn back to the kitchen and grab the large orange ceramic platter of meat. I’m not really a cook-cook, but with a stick of butter, salt, pepper, and onions, I can totally make something nice happen to a pork loin. And if I put it on some great Fiesta ware, I almost look like I know what I’m doing. As long as you don’t mind the fifteen million calories. “Somebody! Anybody?” I call out. I guess it’s nobody. Nobody but me. This platter is heavy and I really don’t want to have to go to the door with it. But the doorbell is ringing so incessantly it looks like I might have to. Just as I give one of those does-it-always-have-to-be-me sighs and walk over to the front door, I hear Cody’s footsteps. “I’m coming, Mom,” he says. I walk to the door, my gold clogs pounding the original creaky wood floor. Cody always says how I drive him crazy with my clomping, but I have a thing against walking around with bare feet in the house—I can’t stand the grime—so, oh well. If he didn’t want to listen to my feet, he could have gotten the door himself. I’m almost there when I catch a glimpse through the beveled-glass win- dow . . . I promptly drop the platter to the floor. My father is standing on my front porch. I have not seen him in seventeen years. This sounds like a great read! Adding it to my TBR pile now. This excerpt is awesome, I’ll definitely need to check this book out! Can’t wait to read this one… sounds really good!